The Gallows (2015). It’s been 20 years since a tragic stage accident cuts a drama student’s life short. Now, students return to the scene of his death to try to honor him, and uncover the disturbing truth about the young man’s death. First time directors Travis Cluff and Chris Lofing bring us the strange tale of Charlie Grimille, a Nebraska high school student and devoted theater buff who is cast as The Hangman in a morbid school play called “The Gallows.” His role requires him to dress up in a leathery stitched hood and pretend to hang the play’s hero, August. On October 29th, 1993, the actor playing August chickens out on opening night, forcing Charlie to play the absent actor’s part. During the play’s final moments, the wooden gallows prop malfunctions, hanging Charlie for real before a crowded, horrified theater. This opening scene is shot in perfectly faded VHS camcorder fashion, complete with tracking issues. 20 years later, likable football player Reese takes the role of August on the invitation of the girl he has a major crush on, Pfeifer. She’s the school’s reigning theater queen. His video camera toting friend Ryan won’t give him a break about either the crush or the old-fashioned play itself, especially since Reese is a pretty terrible actor on stage. 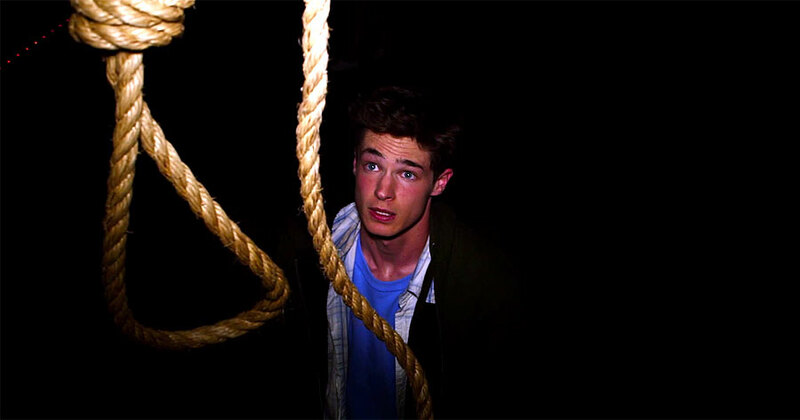 Ryan and his cheerleader girlfriend Cassidy rope Reese into breaking into the school after dark to destroy the props and the hanging gallows itself. They find themselves mysteriously locked inside and encounter Pfeifer, who secretly followed them in. All the locked doors and barred windows force the quartet into cramped maintenance tunnels beneath the building, where they discover the school janitor hanging from a noose. Charlie’s back, and he isn’t happy. Found footage, which boomed after the undeserved success of “The Blair Witch Project,” is a double-edged sword. At best, it can convey an atmosphere of realistic tension that glossier big budget flicks can’t touch. At worst, it provides a cheap method for any idiot with a camera to become a wannabe auteur. A budget, studio-backing and complex cameras are no longer a barrier to making a movie thanks to the rise of digital video. This film in particular is filmed on smartphones, school-issued video cameras, security cams and police body cameras. 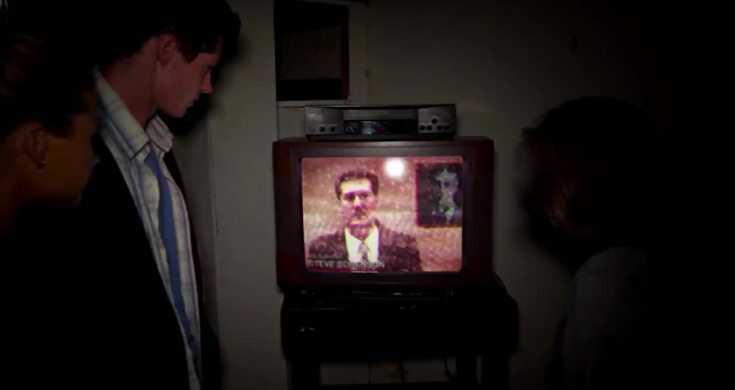 As in many other found footage epics, the characters keep filming long past the point where putting down the camera and running would be the logical option. Yes, it’s totally silly. But “The Gallows” excels in areas where other creepfests fail. “Come to the school at night,” they said. “It’d be fun,” they said… liars. The empty high school with its red-lit hallways, unsettling noises and midnight black corridors is a character unto itself. There’s no studio slickness here. Same goes for three out of the four central performances: Pfeifer Brown, Cassidy Gifford and Reese Midler turn in convincing portrayals far exceeding the low demands of the genre. They easily could’ve been The Drama Nerd, The Cheerleader and the Sensitive Jock, however, each character shows layers that break out of the confines of stereotypes. And then there’s Ryan Shoos as the Sarcastic Weirdo who films every aspect of his life even when he’s alone. He’s simply not tolerable and is the source of the ludicrous filming beyond the point when fighting back or fleeing would seem logical. Who films their own horrifically broken leg after a bad fall? This guy. The kickass ending ties up any loose plot threads as the action switches to police body cameras as the cops raid a suburban house. It leaves you with a nice jolt. I’d tell you more, but I don’t want to spoil it for you. Breaking news as tragedy strikes a small, Nebraskan town in the middle of Nowheresville. 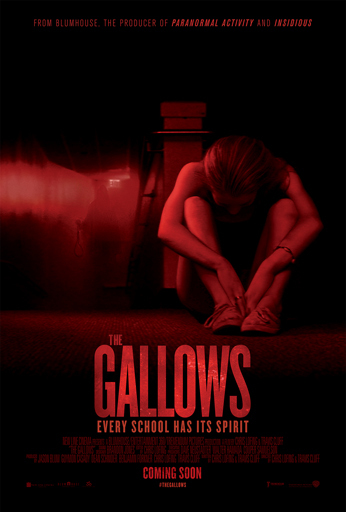 “The Gallows” is completely bloodless and barely justifies its R-rating, so if you’re looking for a smorgasbord of blood and guts, skip it. Instead, it excels at eerie psychological tension as Charlie drifts into frame to lasso another victim with his magic nooses. Doomed in death to forever play the Hangman role denied him in life, he may have a secret connection to two of the four students running from him. If you like atmospheric found footage films with solid characters and smart supernatural killers, this film is for you! Tagged Blumhouse, Cassidy Gifford, Charlie Grimille, Chris Lofing, found footage, Pfeifer Brown, Reese Midler, Ryan Shoos, The Blair Witch Project, The Gallows, Travis Cluff. « Ash Vs. Evil Dead: The Camp, The Mayhem, The Main Man Ash Williams is Back! Since the Gallows was made for $ 100 grand and will recoup its own budget pretty rapidly, they are probably thinking sequel. I’m not sure how it could really work. I hope they don’t take the STAB route and make a sequel about a movie being made from the murders in the original.